When my husband and I were camping over the three day Labour Day Weekend, we spent one entire day in the city of Duluth, Minnesota. We crammed so much into that one day it was amazing! 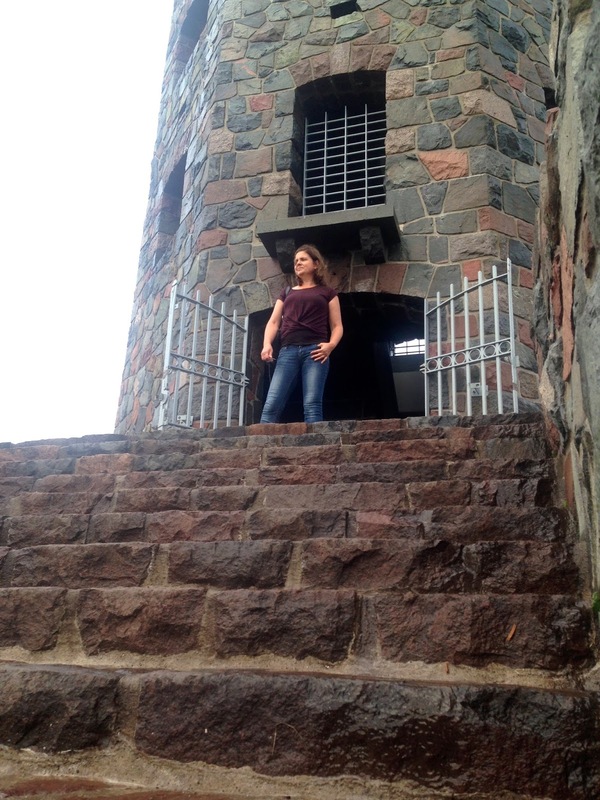 I've already shared with you The Flowers of Enger Tower Park, but for this week's Travel Post, I'd like to show you the Tower itself! Enger Tower Park is located high on a hill above the city of Duluth. It's very easy to find, just look up! We spotted it the minute we drove into the city. 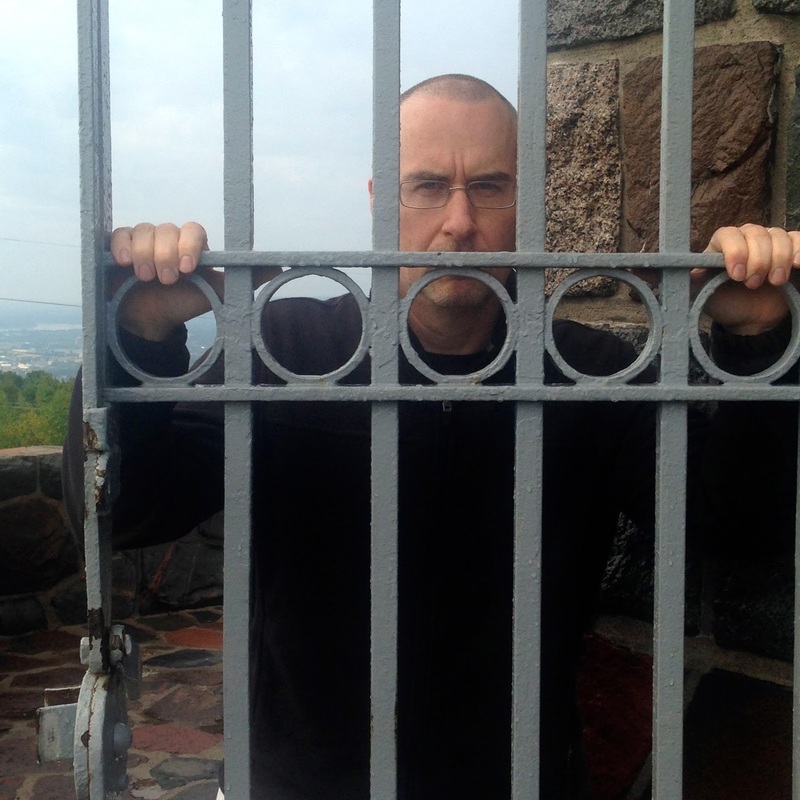 It is located near US Hwy 53 North and Duluth Minnesota Skyline Parkway. It is quite the scenic drive to get to the tower, albeit a bit nerve-wracking too if your afraid of heights as I am. The tower was built in 1939 and is five stories tall. It is made of blue stone taken from the region. 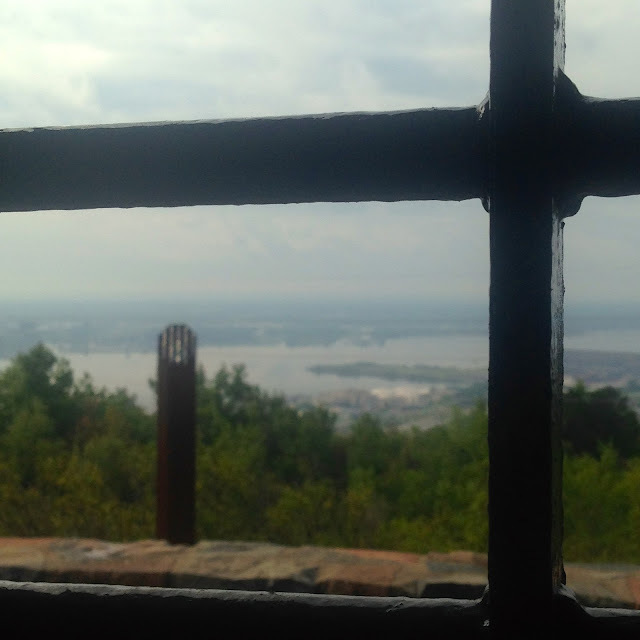 It looks out over the Duluth Harbor and the St. Louis Bay. 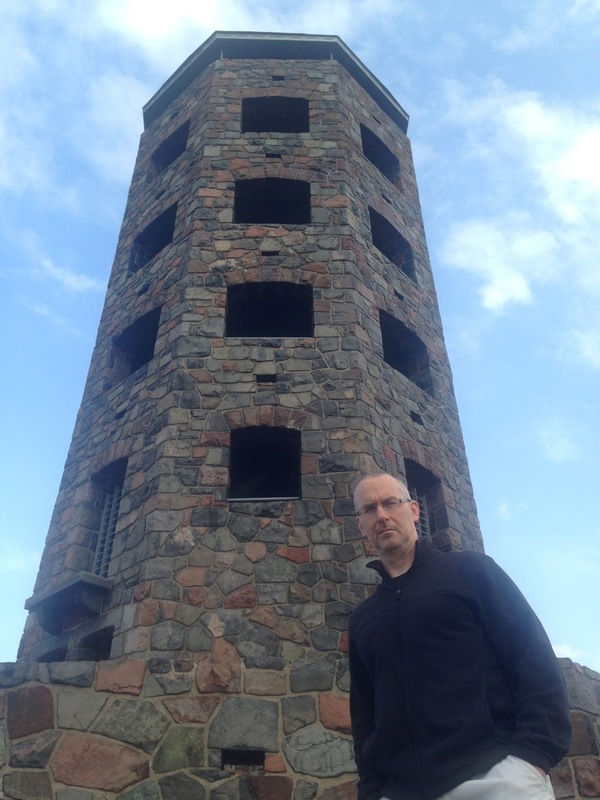 The very top of the tower is 531 feet above the level of Lake Superior. At the top is a green beacon that can be seen for miles. There is no admission or parking fee for this attraction. 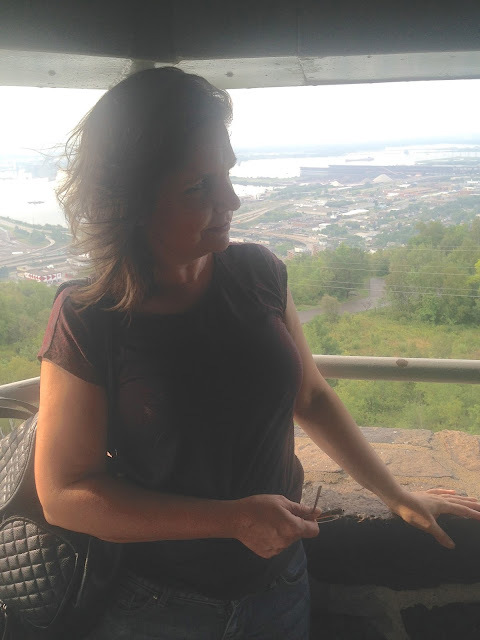 Just walk right in, climb a mere 105 steps, and enjoy the view! Of course we had to take advantage of the iron gate for a fun photo before we walked in! Each landing on every level has windows to look out. Because the tower is shaped like an octagon, you get 360 degree views of Lake Superior, the city of Duluth and Superior, WI, the Enger Park Golf Course, the park, and hillside. See the big ship in the photo below? It's a HUGE ship, and you may have noticed it in my Sunday Garden Photos of Leif Erikson Park. The bridge is also amazing and huge. It's a lift bridge, but it goes straight up in the air instead of separating. I'll have more on that bridge in next week's travel post! While one side of the tower offers gorgeous views of Lake Superior and the cities of Duluth and Superior, WI, the other side shows the lush greenery of the golf course and surrounding hillside. We didn't have time to drive down it, but there was a narrow strip of land across the lake that was so interesting. It reminded me a little bit of the islands in Florida! 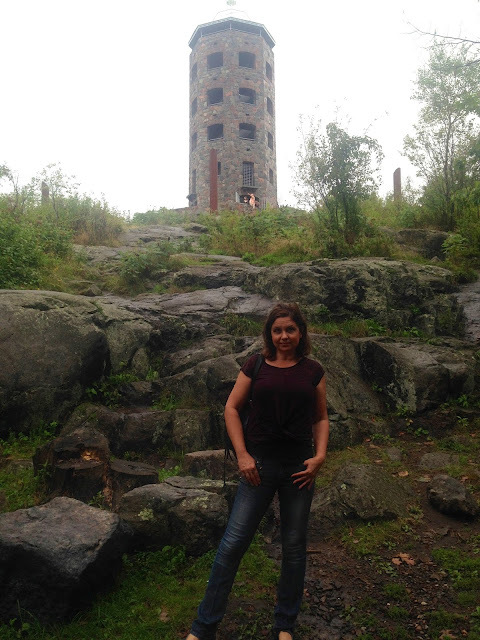 It had rained heavily the night before, so when we we arrived at Enger Tower Park the next morning it was quite overcast. I wasn't too disappointed as Duluth is not too far from where we live, so we can always go back on a sunnier day. I'm sure it's a gorgeous view in the fall! The tower is also lit up at night. We were there during the day, so we never got to see the tower all lit up, but there's some pretty pictures and video for you to see HERE. Such a beautiful tower and those views are stunning! Beautiful views! You look beautiful too. What beautiful vistas! It would be something to see it all lit up at night! Thanks for joining us at The Maple Hill Hop!